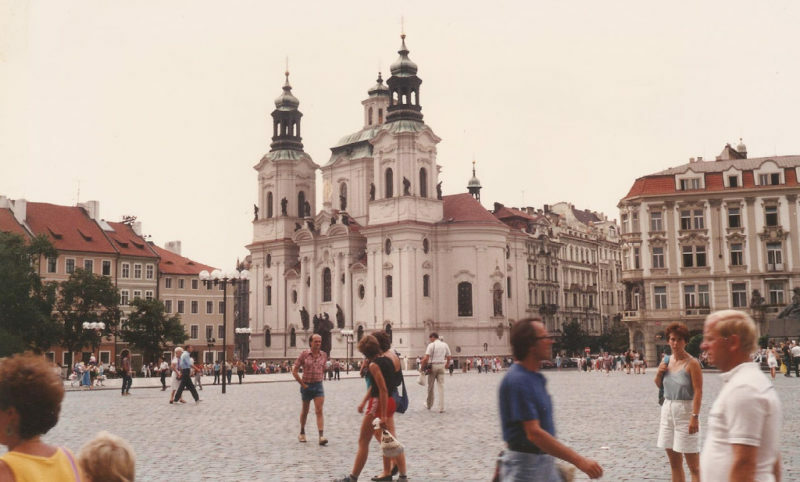 It was Prague that first attracted me to the idea of touring Czechoslovakia. It had looked so attractive in photographs and had stirred my imagination with its Hradcany Castle, Charles’ Bridge, and Wenceslas Square. Also, the idea of seeing a communist country appealed to me, so I made a few enquiries. Firstly, British citizens require a Visa, which costs £20 from the Czech embassy, necessitating two passport—type photographs. Secondly, for each day of one’s Visa one is required to change £10 for Czech crowns. I had applied for a 12—day Visa and therefore had to Change £120 at the rate of 15 crowns for each pound sterling. These Czech crowns cannot be obtained in Britain — they may be bought only at the frontier or airport on arrival. .
Czechoslovakia does have a youth hostel network but I had decided to stay at hotels or campsites where chalets were available. I knew no Czech or Slovak, the two national languages, but was informed that both English and German were widely understood. That was not quite correct! Finding a good map was impossible, ending up with a 1:600,000 ‘Daily Telegraph’ motorists’ route-planning map, roughly 10 miles to an inch. Being drawn to mountainous regions I had to visit the Tatras, in Eastern Czechoslovakia, and I also wanted to see Vienna, in Austria. That being so I booked with British Airways to ﬂy to Prague and return from Vienna. Early one August morning, I presented my Allin at the British Airways desk at London Airport and it was wheeled into a large, transparent plastic bag and whisked away. I had had it for 25 years and hoped that it would be carefully handled! 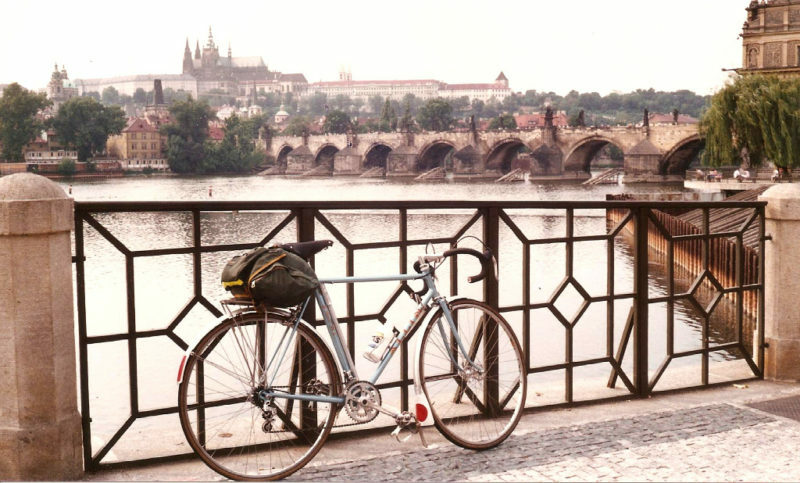 The ﬂight took an hour and a half, and soon I was queueing to exchange money, show my passport and Visa to a stony-faced official, hitch my saddle-bag on the bike, and leave Prague airport. From the airport to Prague is about eight miles and almost all downhill along a wide, straight road lined with rather drab-looking blocks of ﬂats. The day was hot and humid, and the city packed with tourists. The old quarter was quite entrancing, and soon I was seeing and photographing those very places that had first attracted me in the brochures. 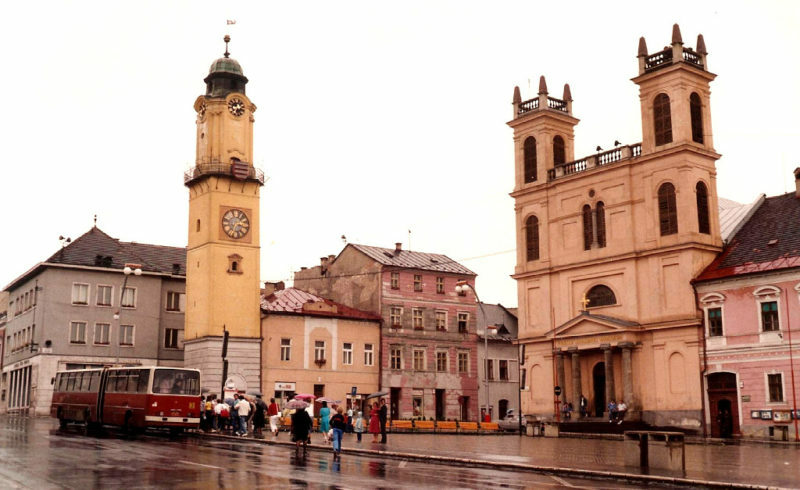 Old Town Square was the focal point of the city — a huge square with beautiful mediaeval buildings on all sides. There was an ornate palace in one corner and in another the old town hall, with an extremely intricate astronomical ‘clock’ as well as the more normal clock. These attracted throngs of tourists to them. I meandered along to Charles’ Bridge, a most exquisite mediaeval structure lined with sculptures, both ecclesiastical and regal, on both sides. It was a cobbled way, closed to traffic, and various stalls had been set up on the bridge selling paintings, engravings, carvings, and so on. The bridge spanned the river Vltava, the major river of the country, and from the bridge could be seen a View of Hradcany Castle, a towering fortress on a rocky spur overlooking the city. The majority of the tourists in the city were German or rather, as I later found out, East German. Away he went and I was hard pressed to stay with him over cobbles and tramlines but soon we reached the Cedok office, the Czechoslovak tourist agency, through which virtually everything is booked as it has a complete monopoly. Well over two hours later I reached the front of the queue. ‘I’d like one room for one person for one night, please,’ I said, trying to be as easy to please as possible. Luck was with me. The hotel Zlata Husa would put me up for the night. It was just round the corner and it was expensive, but I did not care. I simply wanted a place to sleep, a shower, and a meal. Next day an easy exit from the city cheered me, though the morning was grey. 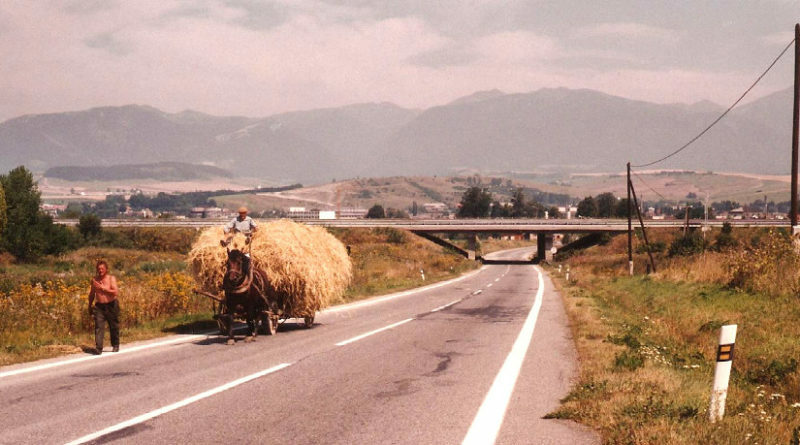 The road was smooth, drivers were careful and polite, the country open farmland I was heading east for the Tatra mountains, and the road soon became hilly. The soil was rich black, with fields of maize and sunﬂowers. There were no hedges and few trees. I was surprised to see no birds, cattle or sheep. On again I pedalled, the road now lined with apple trees laden with fruit. Finding a hotel with a room at Pardubice was straightforward, and soon I was out exploring the town. A department store beckoned and in I went. By western standards it was primitive, no decor, dingy lighting, and a very, very basic range of products. The locals were quite happy though, browsing, chatting and laughing as elsewhere. Dinner at the hotel cost £1.50 including two beers, and just as I was finishing a heavy thunderstorm broke. That cleared the air somewhat, though it was still humid. The wind had been helpful since day one and continued so next day. Reaching Vysoké Myto I stopped for elevenses. As I basked in the sunny town square my bike attracted a deal of attention from both youngsters and adults, with people peering at the head badge, pointing and discussing. I asked a group of boys in English if they would like to buy it and they gaped at me in surprise. Leaving the town I encountered a large Russian military convoy heading west, comprising mainly amphibious vehicles but with lorries as well. The terrain became hilly and wooded and I spied a pair of eagles circling a bluff to my left. Birds of prey fascinate me, and I stopped for a minute to watch them. Glancing at a small coppice by the wayside I spotted a monument hidden by foliage. On parting the branches I discovered a crucifixion sculpture with a German inscription. The monument appeared to be about a hundred years old, and was, I suppose, erected while this region was part of the Austro—Hungarian empire. The coppice appeared to have been deliberately planted to hide the monument. The route became harder, with long climbs and beautiful 40-mph descents on well-surfaced roads, with a final five—minute freewheel into Mohelnice. The hotel was full, but a nearby camp—site had a chalet for me for £7. 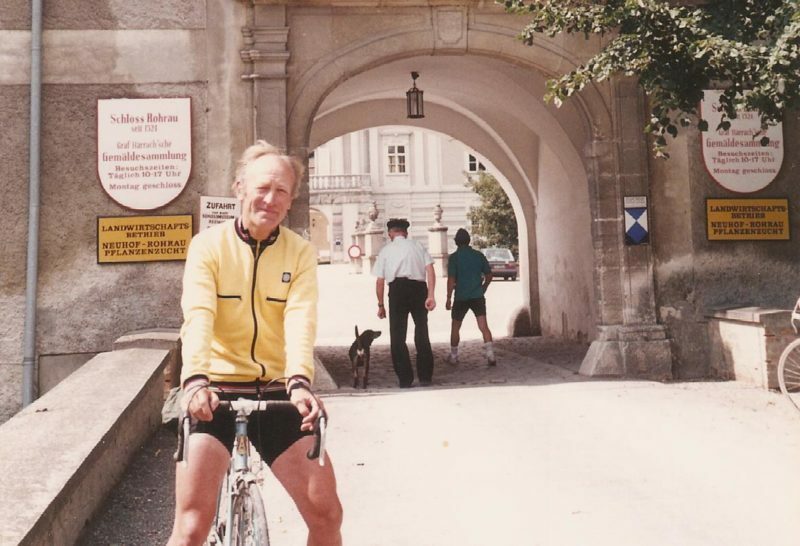 My bike went into my room, and soon I was lazing in the sun on the grass surrounding the swimming pool, among a crowd of Czech and East German holiday-makers. Everywhere I stopped, hotel or camp-site, I was asked for my passport and my Visa. Punctiliously the visa would be stamped with a thud, then signed, with dates of arrival and departure entered. Donning my track-suit top to combat a chilly morning I set out next day for Olomuc on a dead flat, beautifully surfaced dual carriage—way. With a tail wind I really sailed along in my top gear of 76 inches, covering the 25 miles in 63 minutes. The effort warmed me up and off came the top. The terrain changed to hilly again, with alpine—type meadows and hay—making in progress. Still the fair wind wafted me along. Stopping for a moment for a drink from my water-bottle I was rewarded with the sight of two young deer in a meadow about 30 metres from the road. Another camp-site at Roznov was my home for the night, the day’s mileage 70. The elderly lady who booked me in advised me to visit a replica of a mediaeval wooden village nearby, which I did. This was very interesting, with beautifully made farmhouses, cottages, cattle pens, and even a church. High above the town was a wooded hill. Now began my entry into the Tatra Mountain range. After a good breakfast in the camp-site restaurant I set off on an hour-and-a-quarter climb to Makov. The road surface was perfect, the road being newly built and running parallel with the old road which went through the Villages. A puzzling feature was the absence of any links between the old and new roads. I could not have entered the Villages if I had wanted to! The climb became steeper and I debated for some miles whether to change down to the little ring. Eventually my legs ordered me to! The scenery was now mountainous with fir—clad slopes bearing down on the road, interspersed occasionally with rocky outcrops. As I reached the top of the climb I heard musical pipes being played and saw three or four tinkers selling the pipes to the delighted children of tourists. Spotting a restaurant nearby I parked my bike in the shade and ordered grapefruit juice and a bar of chocolate. Off again I set, heading for Zilina and lunch, and then on to Martin, my day’s destination, a ride 0f 70 miles. Seeing some grapes on a market stall I bought half a kilo and popped them, minus the stalks, into my water-bottle for the morrow’s ride, adding water to keep them moist. Though I had not planned it, that ride was to be 85 miles. Leaving Martin at 8.20 in warm sunshine I was enthralled to see storks gliding gracefully over the fields and river, their huge, powerful wings looking majestic in the morning sun. Others were fishing in the river, rapier-like bills poised to strike any unwary prey. Still the road was climbing, through sleepy old farming Villages, at once tumbledown and picturesque. On to Liptovsky—Mikulas for lunch I rode, over an increasingly hilly road, to be rewarded with the best meal that I had had. It comprised steak, chips, eggs, and peas and with a drink, cost less than £4. 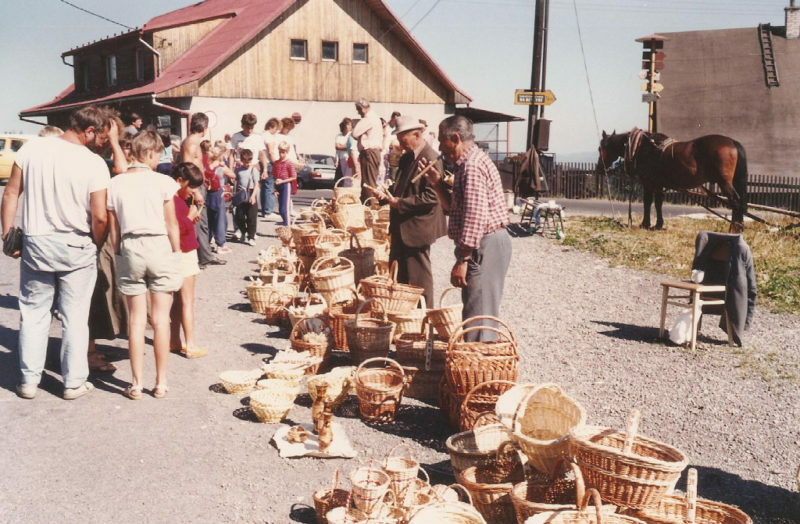 Now I was between the High and Low Tatra Mountains and the road climbed through a broad valley, the mountains wreathed in mist although the day was sunny and hot. Having ridden about 65 miles I started to look for a room, but everything was full, both hotels and camp-sites. I was torn between going on to a large town — Poprad — or turning back. I decided to go on. The road was like a giant switchback, huge ups and downs, and no shade. The next 20 miles were extremely hard and I staggered into Poprad exhausted. There were two hotels. The first was full. The second was full. ‘Now what do I do?’ I puzzled. Then an idea! Try the police station. With luck I found it quickly and clattered in, shoeplates tapping on the tiled entrance. Three bored policemen in a radio—room looked up from doing a crossword and chatting. They spoke nothing but Slovak. Somehow I explained my long journey, my fatigue, and that both hotels were full. The senior man scribbled a note and handed it to me, intimating that I return to the Gerlach hotel with it. The receptionist looked up as I clip—clopped across the vestibule towards her. Her face was hard set. Without a word I held the police officer’s note up in front of her. It was amusing to see the change in demeanour as she read the terse, two—line message. ‘Your pasport and visa’ she stuttered in embarrassment. My spirits quickly revived under the shower, and I blessed the policeman and his magic note (which I still have). The map showed a mountain pass about 3,600 feet high early on today’s route then mainly downhill after that. The road rose easily at first but the last four miles were 1—in-8 round numerous hairpin bends. I was glad of my 35—inch bottom gear and just plodded up until the top, where I took a couple of photographs. The sky was leaden and sure enough rain soon followed. I donned my racing cape and picked up speed on the downhill route, coming across two car accidents in three kilometres. One car had careered off the road and lay on its roof on the grass verge. Police, in their distinctive orange and white cars with the letters ‘VB’ printed on doors and boot, were much in evidence. Now the rain came down heavily and I rode non—stop to Brézno, about 50 miles. It was Sunday, and church bells pealed across my route in many villages, with villagers dressed in their Sunday best wending their way in small knots, umbrellas up, to church. My destination, Banska Bystrica, 78 miles, I reached at 2.20 and to my relief found a room at my first attempt. Many policemen were in evidence in Banska, always in pairs, standing around on street corners or in doorways. They eyed me curiously but none ever spoke to me, though they chatted together in subdued voices. Another long ride, 83 miles, awaited me next morning, and it was teeming with rain — again. My road turned into a motorway, and I got lost in hilly villages trying to find an alternative route. Eventually I hit upon the correct road after questioning people scurrying in the rain. Low cloud hid the fir—clad mountains but I was following the downward path of a river so the ride was easy. I was riding on a road signposted ‘no tractors, no horse—drawn vehicles, no cyclists’, when a police car overtook me. Holding my breath I waited, but it continued on its way. Today’s destination was Nitra, a pleasant, busy—looking down with shops to look at. To dry my shoes and washing I arranged them near a table-lamp in my room and left them. They were dry by next morning. Bratislava, my last stop in Czechoslovakia, lay 55 miles away, but that ride was the hardest of my life. Torrential rain and high winds delayed my start but at 10 o’clock away I went, to be soaked in five minutes. The route was flat and exposed, with no trees or hedges for shelter, and the wind tore at my cape sleeves, threatening to rip them off me. Huge pools of water lay along the road, and every passing lorry drowned me with a huge bow wave. Grit lay everywhere and my worse fear was realised – I punctured. Luckily I had just gone under a road bridge and I turned back under it to change the tube. I also mended the puncture — a very lucky move, for I had not gone four miles when I punctured again. This time there was no shelter. I was alone on the gale-lashed road, lorries flying past and drenching me. No sooner had I levered the tyre wall off the rim than the tyre was full of water! Feeling very sorry for myself I changed the tube, inserted it into the waterlogged tyre, and inﬂated it. My patch held, and I continued battling into driving rain and high winds, feet squelching in sodden shoes. Reaching Sered I paused at a junction with no direction sign, wondering which way to go. A woman’s voice spoke to me. Middle—aged, shopping-bag in hand, she stood next to me. ‘Kaffee?’ she enquired, pointing into the entrance of a block of ﬂats. She was inviting me in for coffee, me a total stranger, shivering and bedraggled! Gladly I accepted her kind offer. Half an hour later when I left her ﬂat, conditions were unchanged. 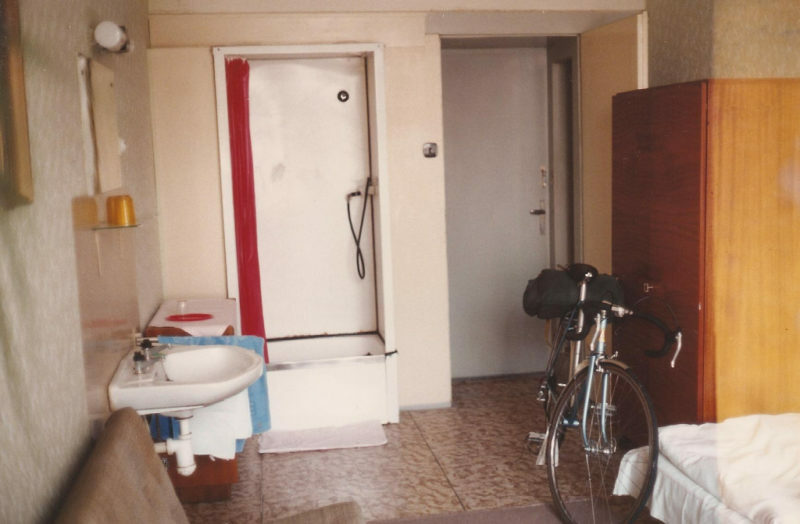 Every kilometre felt like riding a ‘25’, but finally I rode into Bratislava, and after getting shunted from Cedok office to Cedok office all across the town I was finally directed to a hotel three miles out. Oh, the relief of entering the hotel room and having a hot shower! Tomorrow I was leaving Czechoslovakia and entering Austria, heading for Vienna. ‘If it’s raining I’m going by train,’ I said aloud to myself. Never before had I even thought that! Sunshine on the wall greeted me when I awoke next morning, and my clothes had all dried. Back into Bratislava I rode, then over a very high bridge and to the frontier post, to be greeted with soldiers armed with machine-guns and dog-handlers with muzzled alsatians. Delivering my visa up I rode along a causeway towards Austria, passing a wooden tower surmounted With a machine—gun en route, A soldier looked down at me. ‘Nice morning, isn’t it?’ I called, giving him a friendly wave. Entering Austria felt like coming home, though I had never been there before. Petrol stations were colourful, as were the villages, and I could understand the notices and signs. The cost of living was much, much hlgher, as I quickly found and cake at a beautiful cafe in Hainburg, where I changed some money. Lured by signs, I detoured off the main road six kilometres to visit Haydn‘s birthplace and a near—by Schloss, or castle. Then on to Schwechat, a town near Vienna airport. Accommodation proved hard to find, but eventually, after six or seven requests, I found a room for my last two nights. Austria seemed a very afﬂuent country. Everything was first class — road signs, shops, goods, gardens. Slightly unnerving! Next morning I caught the train into Vienna, a 20—minute ride, and spent the day simply walking, looking, and photographing. I think it the most splendid city I have visited. Reluctantly making my way back to the station I bade Vienna farewell. Next morning I rode my bike the eight or so kilometres to the airport, and was soon settled in the seat of a Boeing 757, winging my way back to London.